Kingston Center is a dominant retail park in Milton Keynes with over 14 million visitors every year. 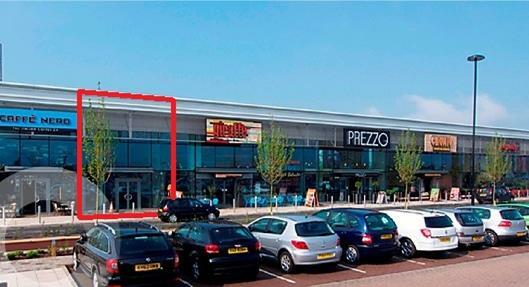 This new build unit is located between Caffe Nero and Giraffe and close to Marks and Spencer, Next, Boots etc. The Kingston Centre is a modern shopping centre situated east of Central Milton Keynes, boasting an annual footfall figure of 14.2 million in 2014. The centre is positioned in close proximity to the A421 main road, just off junctions 13 & 14 of the M1. The centre is anchored by a 185,000 sq.ft Tesco Extra store with 200,000 people living within 10km of the centre. The Tesco Extra unit is supported by an external mall of retail units of various sizes including Marks & Spencer, Next, Boots, Clarks and Costa. Immediately adjacent retailers include Frankie & Benny’s, Nandos, Chiquito, Prezzo, Giraffe and Caffe Nero and the new library is close by. There is free parking for 1,214 cars. The premises are available by way of a new effectively full repairing and insuring lease for a term of 15 years and incorporating 5 yearly upwards only rent reviews at a commencing rent of £37.50 psf. The unit is available for immediate occupation. The ingoing tenant to bear the landlord’s reasonable legal costs together with surveyor costs incurred in regard to approval of shop fitting plans.